For the dads who love their children well … I am thankful. For the moms who do both jobs well … I am in awe! For those who grieve the loss of a dad or hope to one day get to know their earthly dad … I am prayerful. And finally… For my husband, Steve, who’s an amazing dad to our kids! … I am forever blessed. Today is a special blog post for a host of reasons. Number one, it’s my birthday! And number two, today is a chance to honor women in my life who have shaped me as a mom, a leader, and a friend who’s left a lasting legacy. This is also a chance to continue to say how very Blessed I am. Oh, what a sweet privilege it has been to lead a new Online Bible Study with Melissa Taylor from Proverbs 31 Ministries. The latest study is “Let. It. Go. 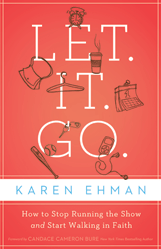 How to Stop Running the Show and Start Walking in Faith” by Karen Ehman. (Available here from Zondervan, 2012). Thankfully I’m a pretty easy-going person and so generally speaking, it takes a lot to rattle me. This is both a blessing and a curse, it seems, because in a previous life I had a peer say on an annual review, “Does she have a pulse? Does anything ever bother her?” By the same token, I know it is a strength of mine as a leader to remain calm in a crisis. And so I jumped into this study thinking it would be helpful to learn some practical tools for helping other women — those in my bible study, and those I serve alongside in women’s ministry, etc. And then I read Chapter 5. “Micromanaging Instead of Mothering.” Boom. Again, micro-managing is not my normal M.O. I’m a big-picture thinker. But … this chapter really touched me and was a powerful reminder that there will come a day when we moms need to fully turn over the reins to our ever-growing children. And that simply does not happen overnight. In the toddler years, offer your kids choices that don’t really matter. After all, they’re toddlers, for pete’s sake!! In middle school, let kids get creative and determine some of their own consequences for crossing the line. LOVE this, and I look forward to hearing what my 7th grader has to offer! In high school, treat your kids like young adults, not babies. You are still their parent, yes, but lead with influence, not with forced obedience. In college, remember your adult children are full-fledged adults. Helicopter parents who swoop in and rescue do precious little in helping their children learn how to fly. During all stages, point your kids to faith. Who doesn’t win when we do that?!? To be honest, there are still several women I’d like to read this chapter, who clearly struggle with helping their children learn age-appropriate responsibility. And quite candidly, I’ve seen adult children with parent enablers who would have done well to learn these principles and apply them as well. But meanwhile, it’s deeply affecting me. Here is a quote I could not get out of my head this past week: “Remember, it’s your job to teach your children to ride, not to pedal the bike for them.” Simple, profound truth that has really resonated with me. Thanks, Karen, for instructing us all! So excited! True confessions, I actually am a conference junkie. And I love, love, love reading about leaders. So a few years ago, I noticed our long-time friend, Cru’s Pacific Southwest Regional Director David Martinelli, was participating in something awfully intriguing. I jumped at the chance to join this thing called a “blogference” to hear what leaders within Cru were doing around the globe. This year, Brian Barela asked me to submit a post about being involved in ministry as a mom. Click here for more of my thoughts on moms as leaders. Take a look-see and enjoy! As Brian says, you can change the world from a coffee shop!